For 25 years we’ve walked the dirt road to the river—a morning ritual. It runs along railroad tracks that serviced the old packing sheds. For the last two years, the tracks have been disappearing, bit by bit (I suspect this is someone’s side job). Now the rails are gone, and ties lie in heaps. 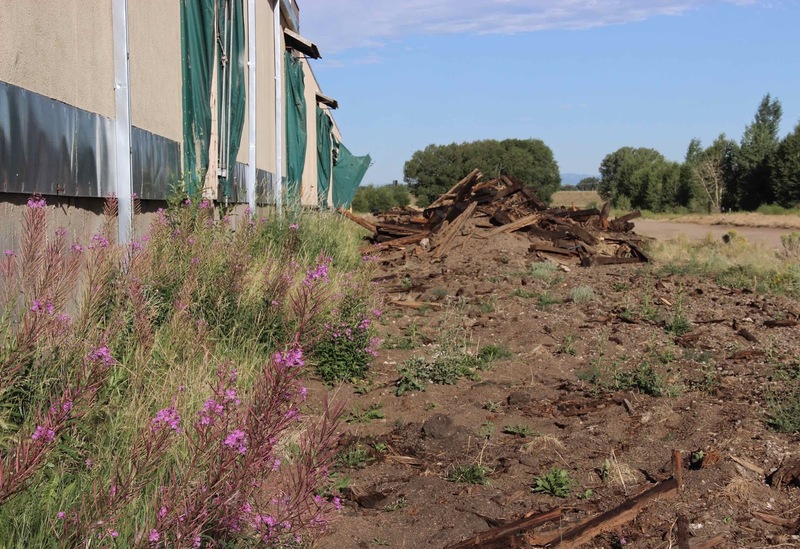 Much of the thistle–tumbleweed vegetation has been bulldozed away. With bare soil, more sunshine (less thistle), and lots of late spring and summer moisture, the old track bed has become a garden of pioneering plants. 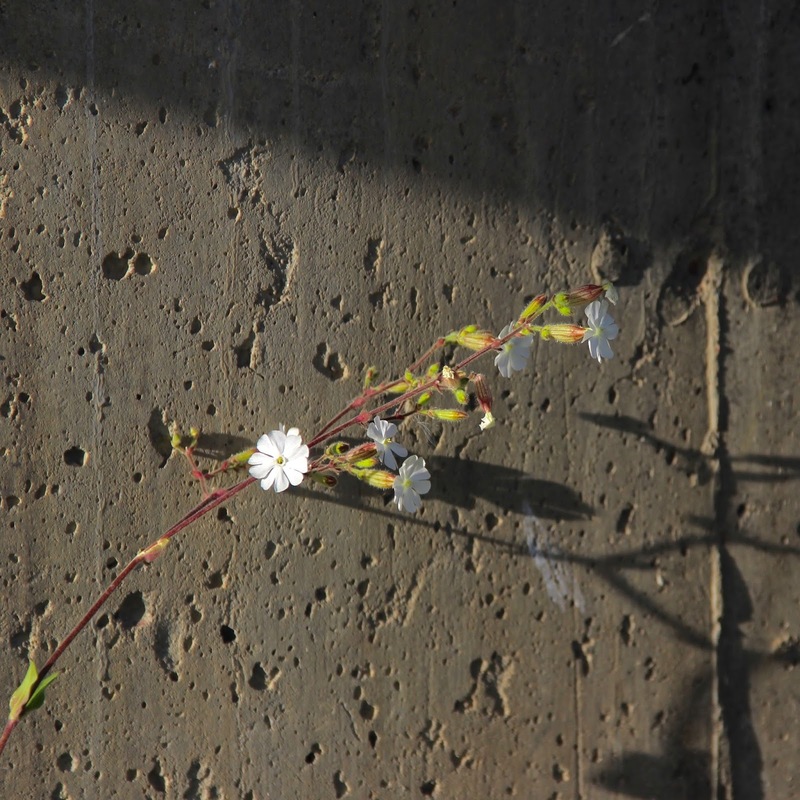 In our yards we call them “weeds” but here they are beauties—high-impact beauties in fact, given the surrounding destruction and decay. Evening primroses are well-represented. 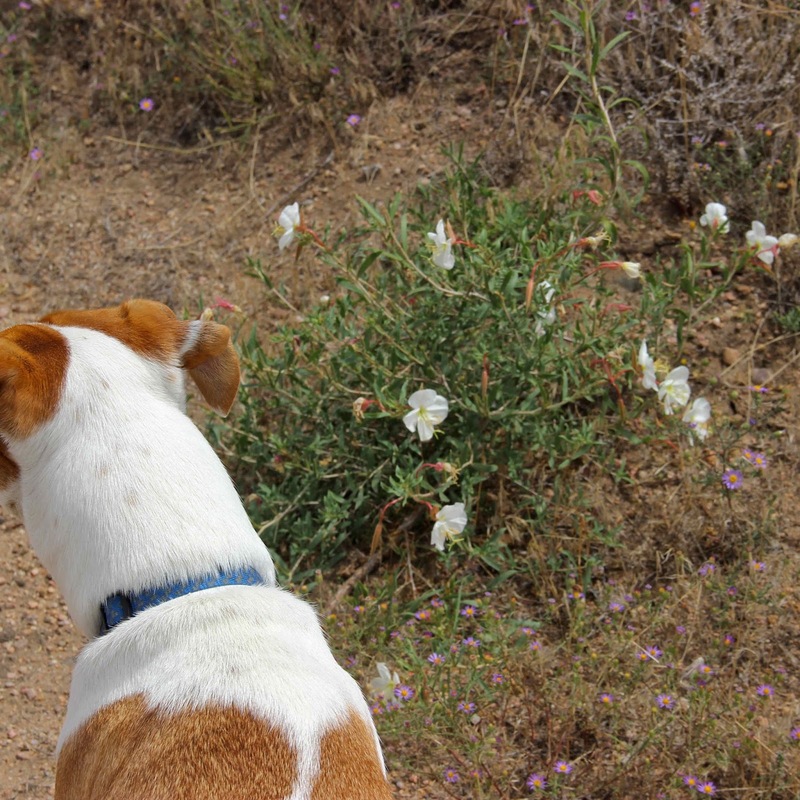 True to their name, the flowers open in the evening, stay open for our morning walks, and then close in the heat of midday. Most of our species are white-flowered and moth-pollinated, hence their nocturnal habits. But there are a few yellow-flowered ones too. I found one hairy evening primrose, Oenothera villosa. It's a common colonizer of open areas along the river, about a quarter of a mile away, and I bet there will be more here soon. The yellow flowers appear to open in the evening and close in the heat of midday, so who are its pollinators if not moths? Or do moths notice yellow flowers? So much to learn. 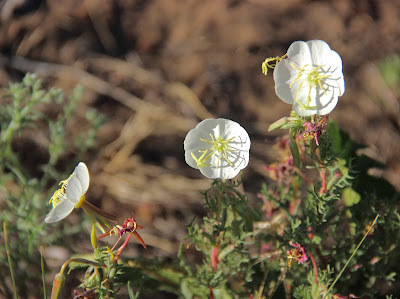 Nuttall’s evening primrose, O. nuttallii, is common along the dirt road. Now it's invading the newly-bare thistle-free soil. 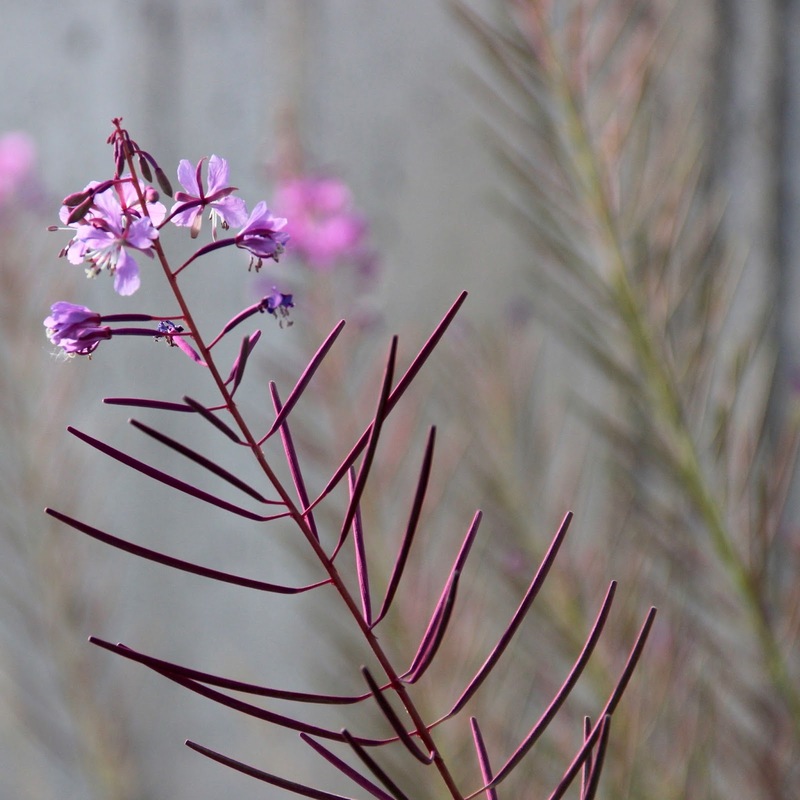 It grows to be almost shrub-like, but being a true forb, it dies back each year. The flowers are about 5 cm across, showy by local standards. 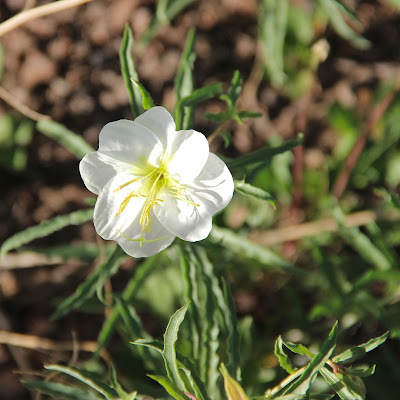 Crownleaf evening primrose, O. coronopifolia, is small perennial herb with flowers about 2.5 cm across. 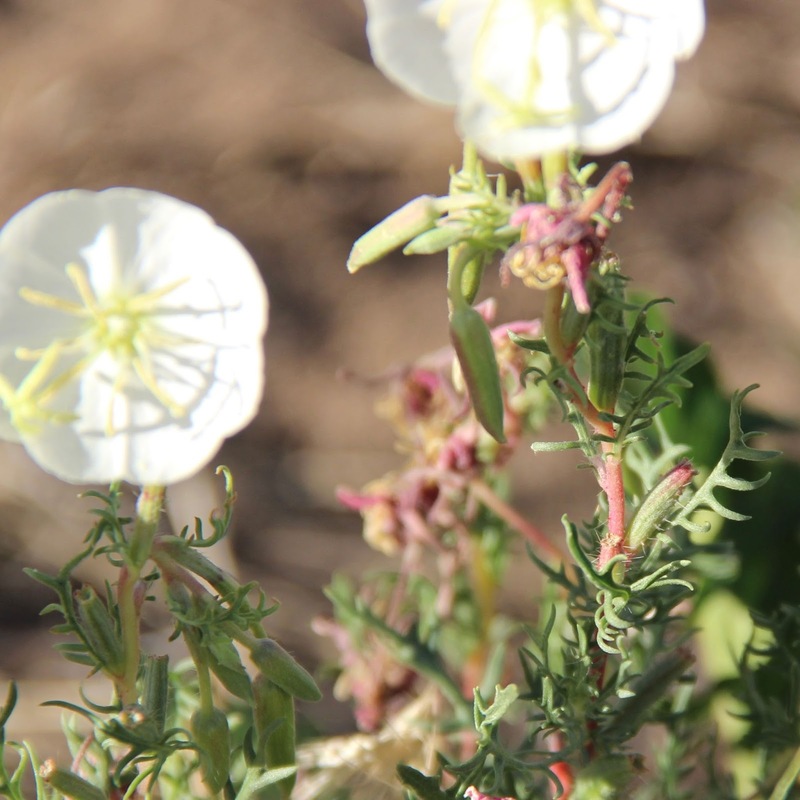 The lobed leaves are said to be suggestive of crowns. UPDATE: For alternative explanations, see Pat the Plant's Comment and my Reply below. 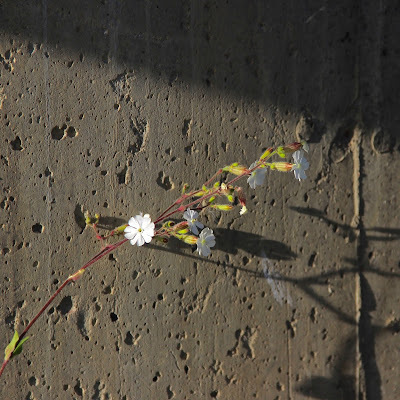 Against the wall stood another flower of the night—white campion, Silene latifolia. 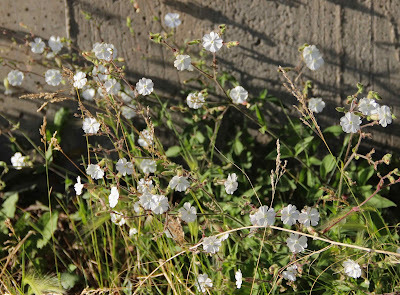 Wikipedia notes “it is also named the Grave Flower or Flower of the Dead in parts of England as they are seen often growing on gravesites and around tombstones.” White campion is dioecious, with male and female flowers on separate plants. This one's a guy—just stamens in the flowers. 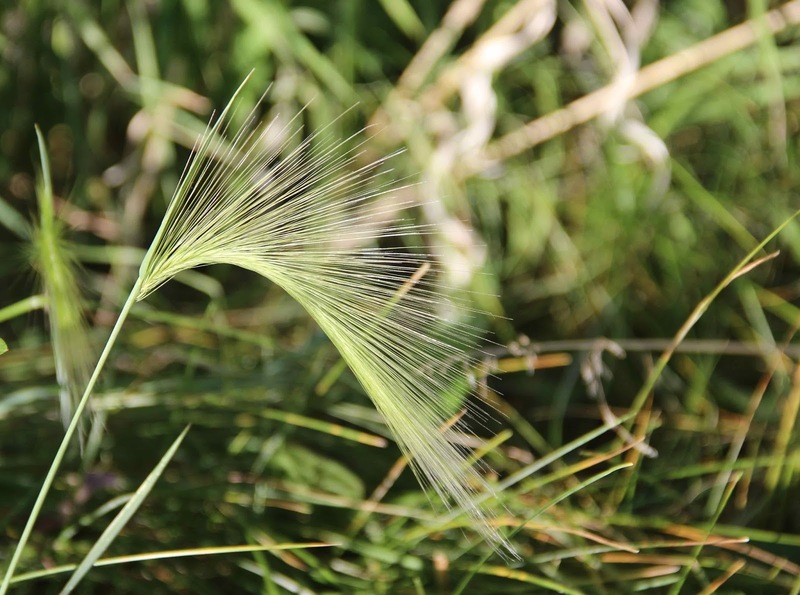 Foxtail barley is common in the Laramie Basin, often on slightly saline soils. 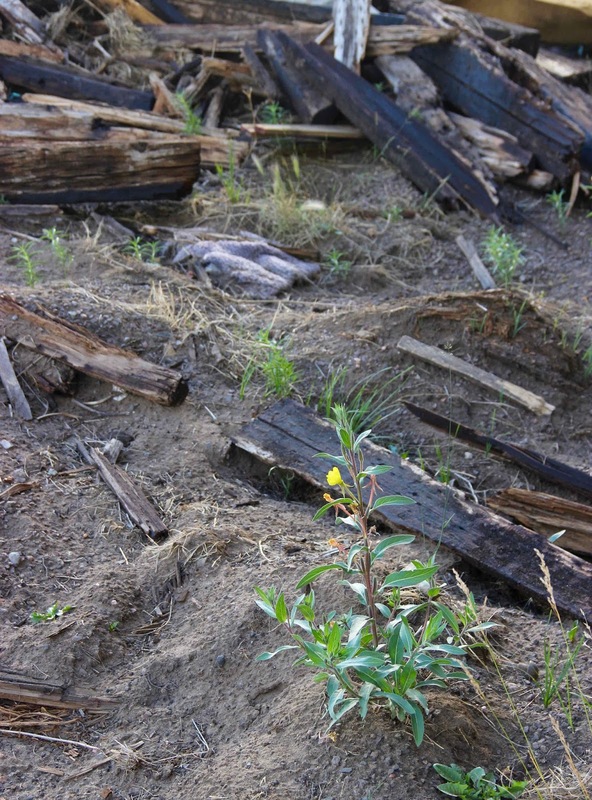 The bulldozer brought sun into its life, and now it’s flourishing, helped by runoff from the buildling. Finally, the surprises. 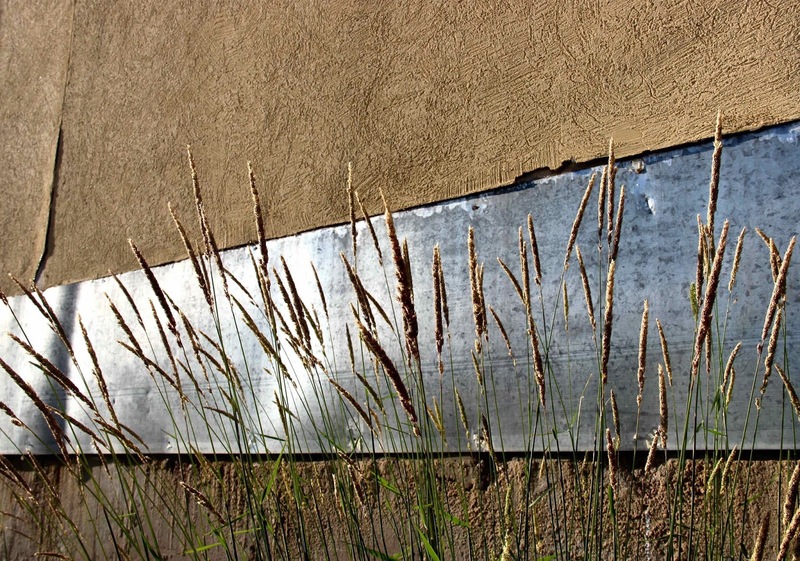 Two are plants of moist habitat—surviving here due to runoff. Based on size, they must have been here for awhile. I guess I didn’t notice them behind the tumbleweeds. 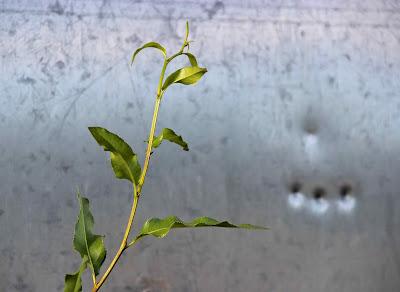 Narrowleaf cottonwood, Populus angustifolia. Its parents probably are among the trees along the river. Meadow foxtail, Alopecurus arundinaceaus, a non-native that usually grows in wet meadows. 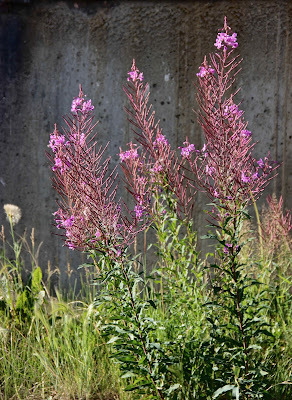 The biggest surprise was fireweed, Chamerion angustifolium (other names include rosebay willowherb and blooming sally). It’s a famous fire-follower, growing luxuriously where fire has burned off both the tree canopy and ground cover, exposing bare dirt in full sunshine. 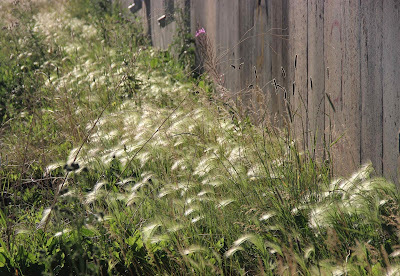 But it also thrives on other kinds of disturbed sites. 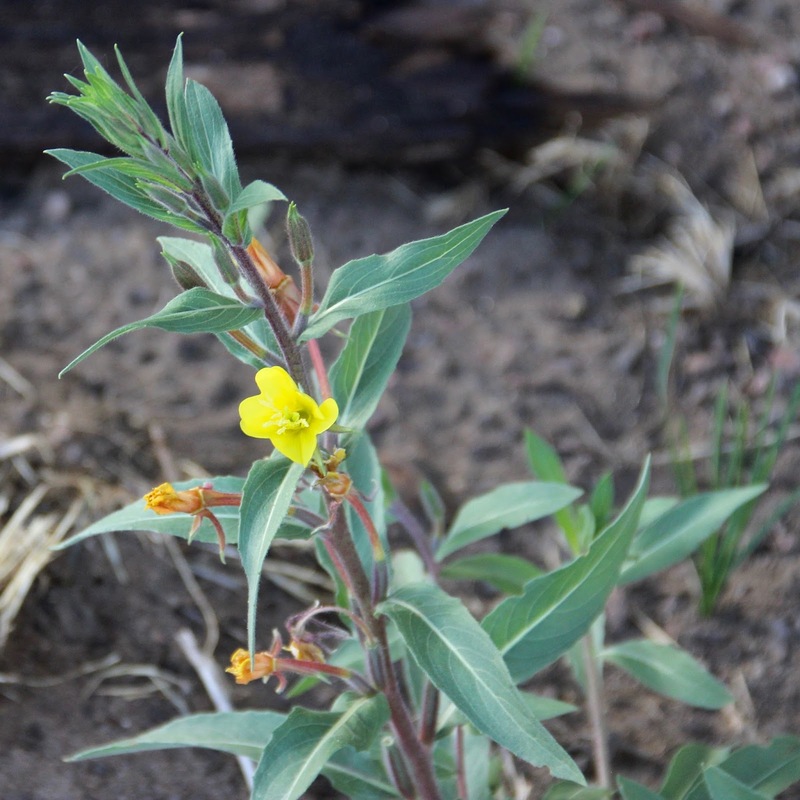 I found conflicting reports—surprising for such a widespread and well-studied plant. According to the thorough and well-documented USDA Forest Service FEIS Database, fireweed does not produce long-term seed banks. However, Wikipedia says seeds remain viable in soil for many years. 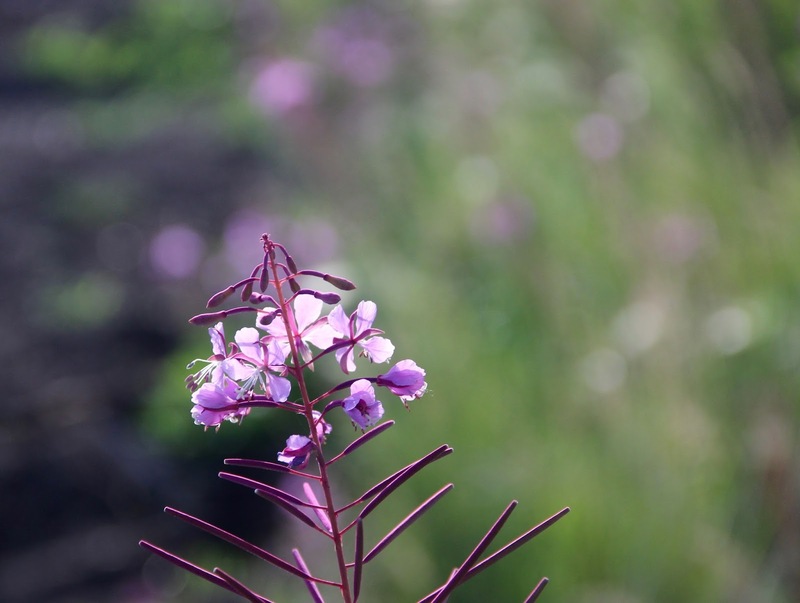 In any case, fireweed produces lots, and they germinate readily in bare soil over a wide range of temperatures. Even so, vegetative reproduction is more common. 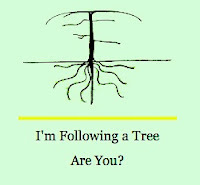 Following disturbance, especially if the underground rhizomes are cut, shoots sprout and grow rapidly, sometimes reaching nine feet in height! Purple and green, my favorite color combination. The long narrow pods are loaded with tiny seeds ... as I found out later. 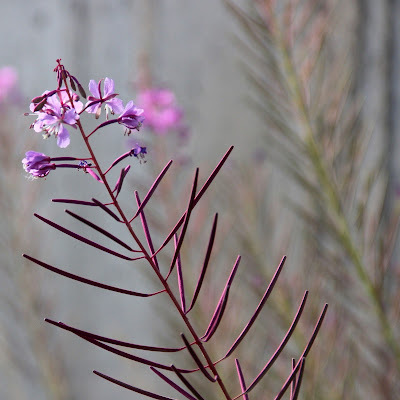 I collected flowering stems from some of these beauties, and took them home for closer examination … and more surprises! What’s your pleasure? South Pass City or Miner’s Delight? 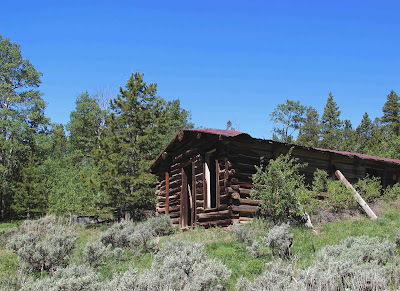 In 1868, a gold rush hit the southern Wind River Mountains. 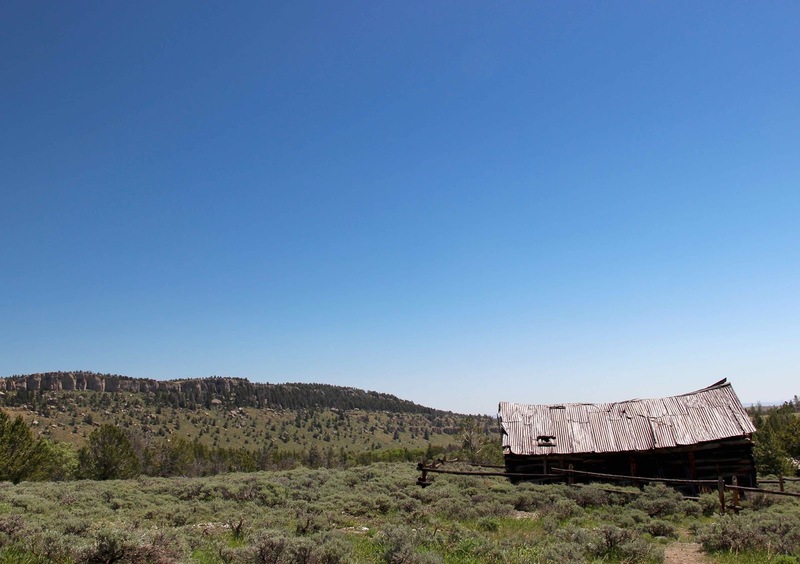 Hundreds of men infected by gold fever poured into the gulches, staking claims. 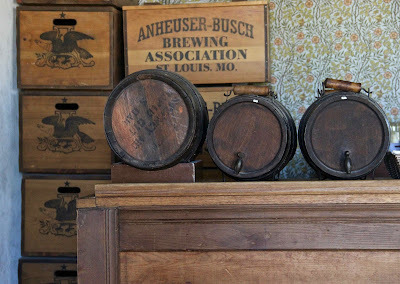 They were followed by merchants, freighters, saloon keepers, brewers, and ladies of the night. 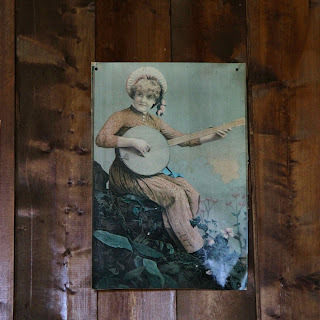 Towns sprang up within weeks—tents, wooden shacks, hotels, stores, saloons, dance halls and jails. Soon the Carissa was processing ore, followed by the King Solomon, Hoosier Boy, Irish Jew, Mary Ellen and many others, on the order of 1500 mines and lodes in all. Regional population peaked at 1500-2000 in 1869. 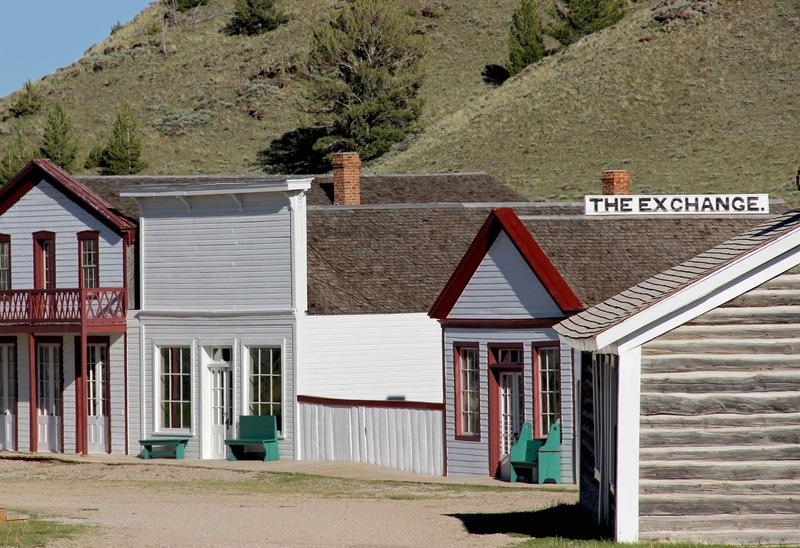 But just five years later, Wyoming’s largest gold rush (small by Western standards) was done. The dreamers went elsewhere. By 1880, the towns were all but abandoned. Yet South Pass City still looks a lot like it did at the height of the boom. Wooden buildings line the dirt street. 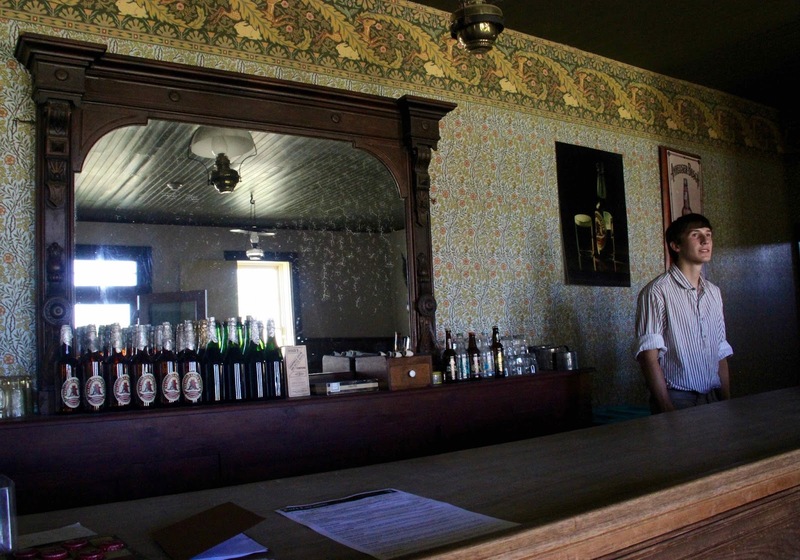 A saloon draws folks in for cold drinks on hot summer days. A woman slaves over a wood stove, baking cookies to sell. The dance hall does a brisk business (in entrance fees). But … something’s not right. 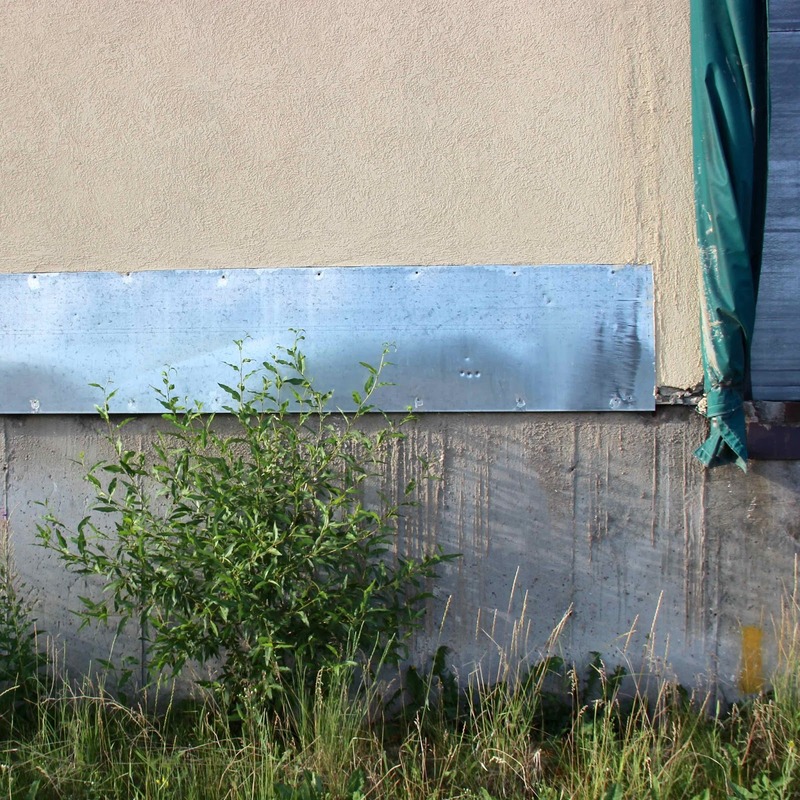 The buildings are freshly-painted and well-kept; there are no burned remains anywhere. 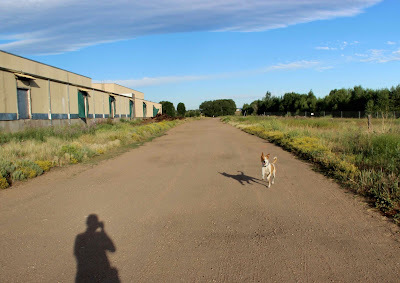 I walked the smooth clean dirt street, breathing fresh mountain air. I didn’t have to dodge ruts and horse manure, swat flies, or breathe dust. And it was quiet—no groaning wagons squealed and screeched down the steep grades into the gulch; no one yelled at the mules. No gun shots. The jail was empty. 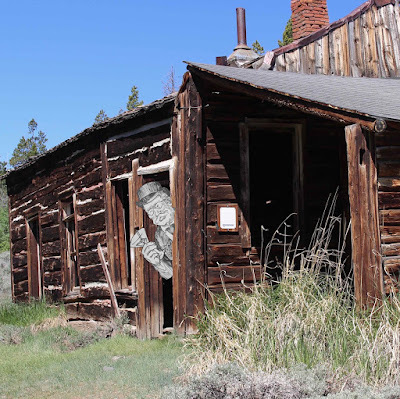 At the Smith-Sherlock Company Store, I bought an ice cold pepsi, and learned that for the last fifty years, the State and volunteers have been resurrecting and maintaining South Pass City as a Historical Site. 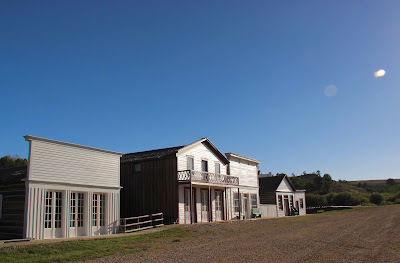 They restored or rebuilt the old buildings, complete with furnishings of the day (a booklet available at the dance hall provides details). 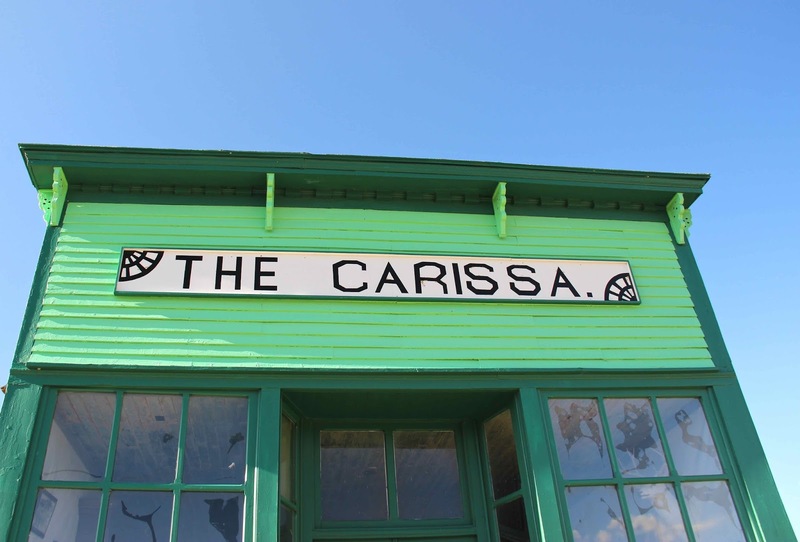 On summer weekends and holidays, volunteers bring South Pass City to life, selling cold sas’sprilla at the saloon, and baking cookies. Just imagine a large dose of chaos and grime added in, and you can experience South Pass City as it was at its heyday. Twenty saloons did business during the gold rush years. 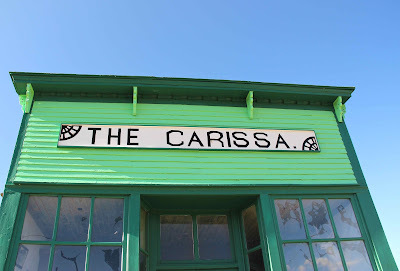 The Carissa was a late-comer, built in 1890 to slake the thirst of those attempting to revive the Carissa Mine and set off another boom (it fizzled). 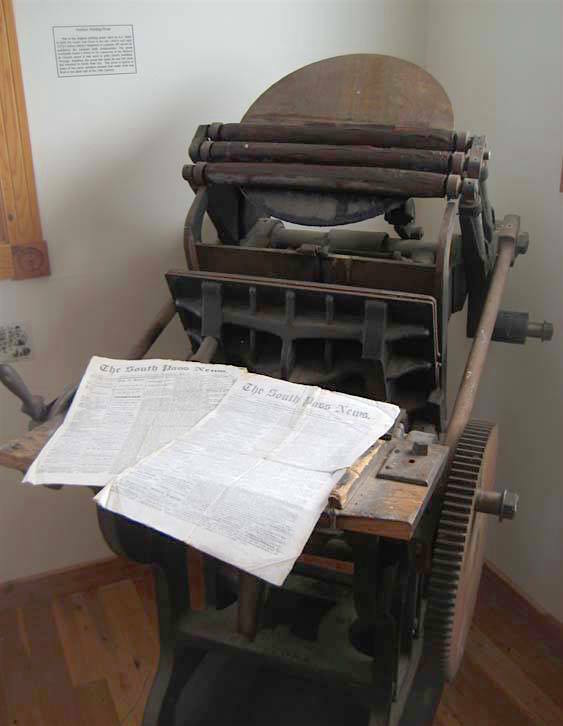 This printing press started out in Cheyenne in early 1869, moved to Laramie in the spring, and by fall had settled in South Pass City. Nathan Baker published the South Pass News twice a week, at 15¢ a copy (source). The Exchange (above and below) began as a bank, but became another of the town's saloons. The Exchange was popular for its a card room. In a gulch about eight miles northeast of South Pass City lies another boom town—Miner’s Delight. This one looks very different. There are no bright colors; in fact, little paint remains. Buildings sit slightly askew. 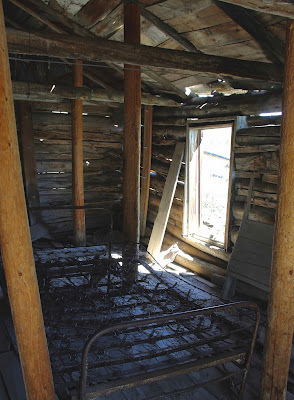 Chinking has fallen from the log walls, and windows and doors are gone. Torn wall coverings decorate the rooms, now inhabited by mice and marmots. Through the ceilings, you can see the sky. 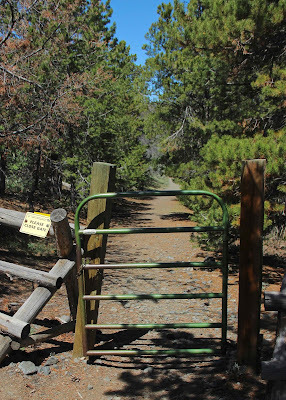 To visit Miner’s Delight, park at the cemetery on the ridge. 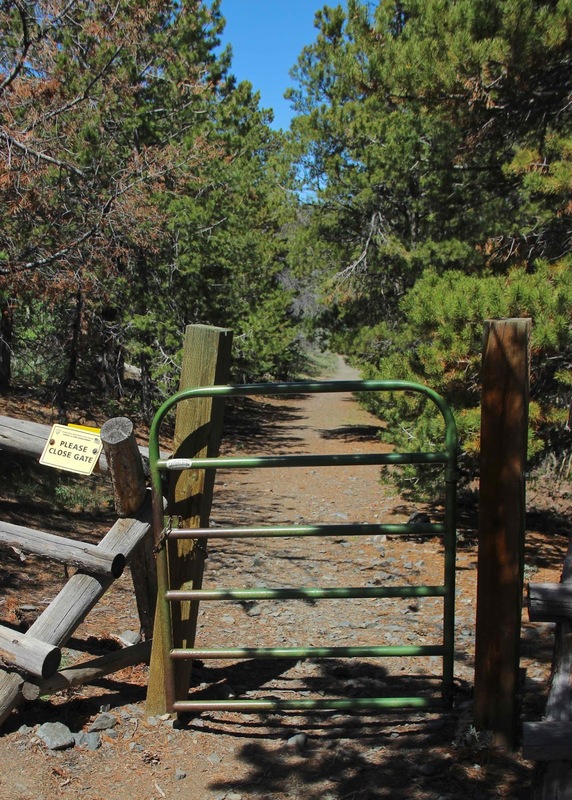 After enjoying the expansive views, walk through the gate and down the trail about a half mile into the gulch. View from Miner's Delight cemetery. 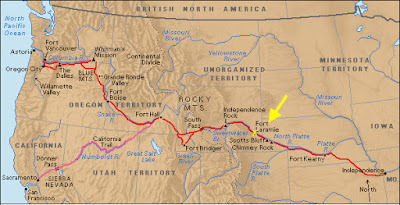 Oregon-California Trail is not far below. Trail down to Spring Creek and Miner's Delight. Cross the footbridge at the ponds on Spring Creek (beaver returned after the town was abandoned), and follow the old main street past buildings in various states of disrepair. 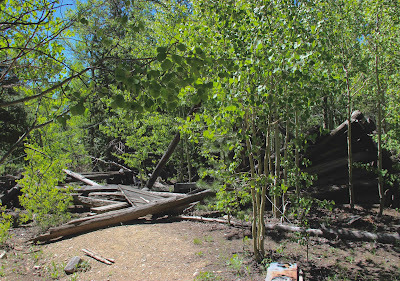 Aspen trees encroach on some, and have taken over the collapsed stamp mill. This was where ore was crushed to be carried to South Pass City for assay, hopefully bringing the miner his delight. 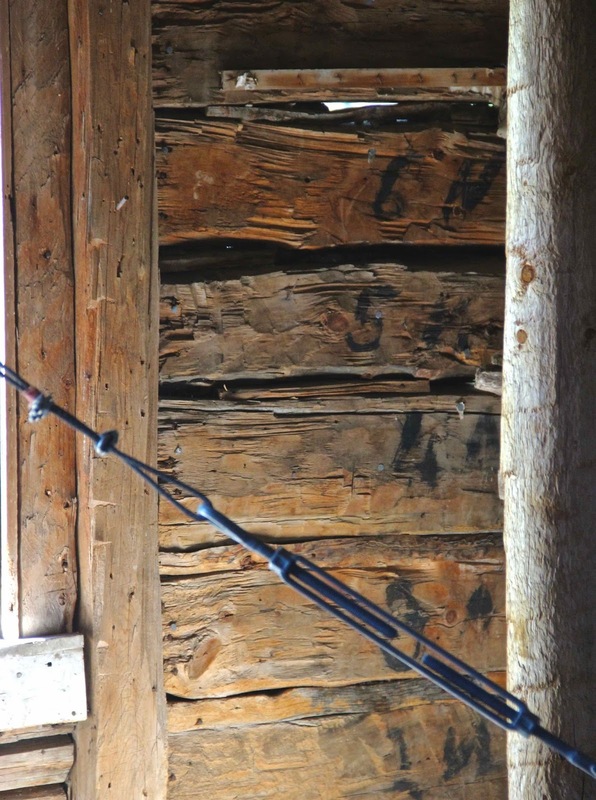 Miner's Delight had its own stamp mill. The town was named for a lode of gold—a miner’s delight—up on the ridge to the west. Ironically, it produced the greatest wealth in the South Pass Mining District, even though the town was the smallest and most isolated. Population peaked at around 100 in 1868, but the boom ended just two years later. A few “mini-booms” followed, repopulating the town briefly. It’s hard to believe this was once a scene of intense human activity, with homes, stores, saloons and a hotel. Now it's almost dead still. An occasional bird sings, and aspen leaves flutter in the breeze. 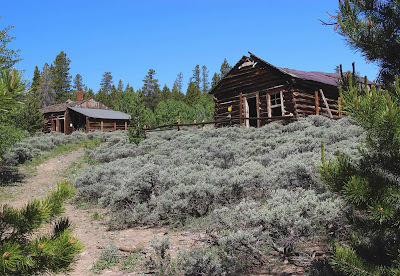 Miner’s Delight is managed by the Bureau of Land Management, which has stabilized the buildings to keep the town frozen in a state of abandonment and decay. The effect is powerful. 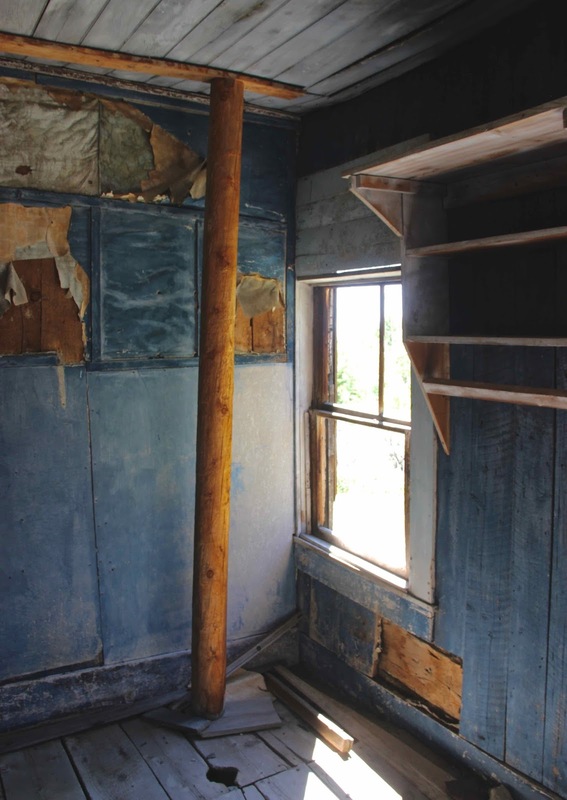 I walked through the empty town, carefully stepped inside the structures, ran my hands over old wall paper, and picked up abandoned tools. I could imagine building, decorating and furnishing a new abode while dreaming of getting rich—or just making a decent living, which would have been fine enough for many of these people. And I couldn't help but wonder—how did they feel when they had to abandon their hard work and dreams just a few years later? Poles hold up walls, inside and out. 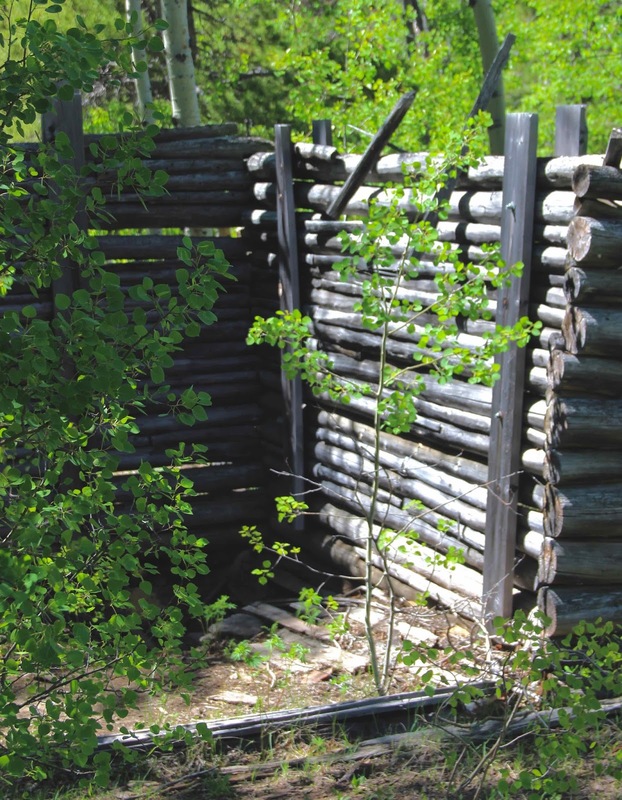 This structure was moved here when Fort Stambaugh closed in 1878. 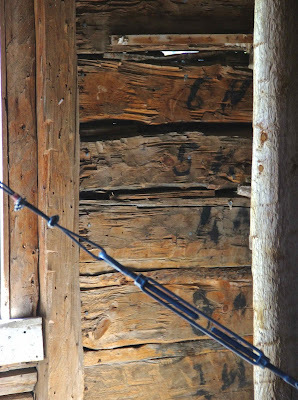 Numbers marked logs for reassembly. So, what’s your pleasure? Would you rather whoop it up on the main street of a booming gold rush town? … or listen to ghosts celebrate and lament the human condition in the peacefulness of aspen groves? I recommend both. Fortunately, South Pass City is not your typical tourist town. Visitation is generally light; there's not much to buy. If you need more excitement, head down into the gulch during Gold Rush Days. 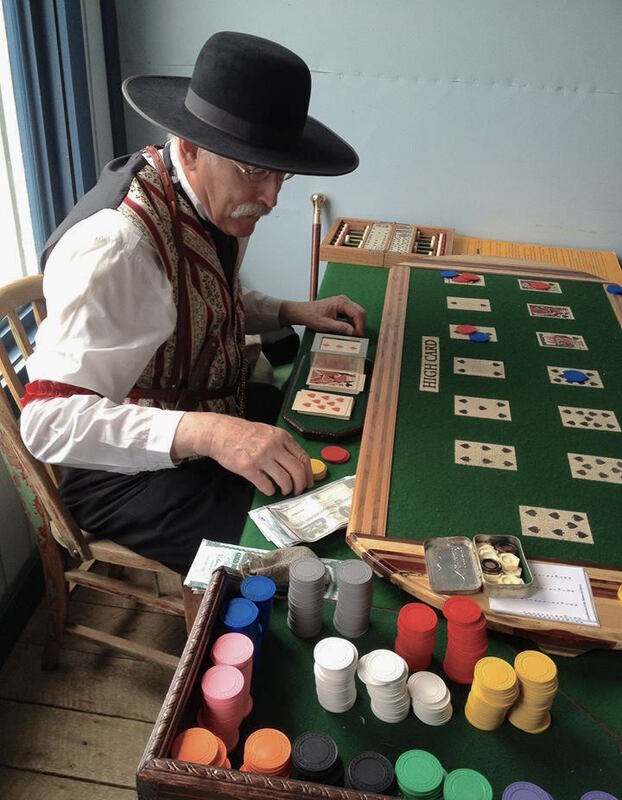 Try your hand at gold-rush-style poker! (source). For a more mystical experience, stroll through the towns after sunset. And listen carefully. Saloon keeper and State Senator "Cocktail Jimmy" Kime was the longest permanent resident of Miner's Delight. In fact, it appears he never left! Lindmier, T., and Georgen, C. 2004. 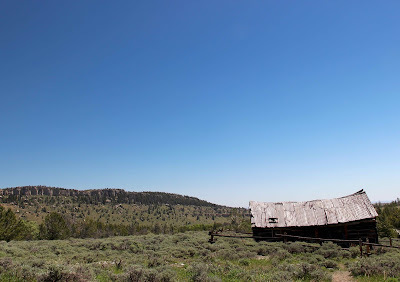 South Pass City; Wyoming’s city of gold. Virginia Beach, VA: Donning Company Publishers. Spita, Joyce. 1980. 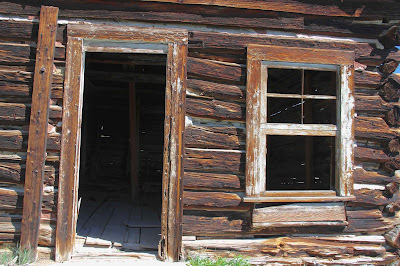 A quick history of South Pass City, Atlantic City: Wyoming ghost towns. Colorado Springs, CO: Little London Press. Should there be trees where once there were none—even though once (as now) there were many? Cottonwoods, boxelders and willows along the Laramie River at Fort Laramie, on a hot day in 2016. In southeast Wyoming, on the Laramie River just above the confluence with the North Platte, Fort Laramie still rises from the prairie. 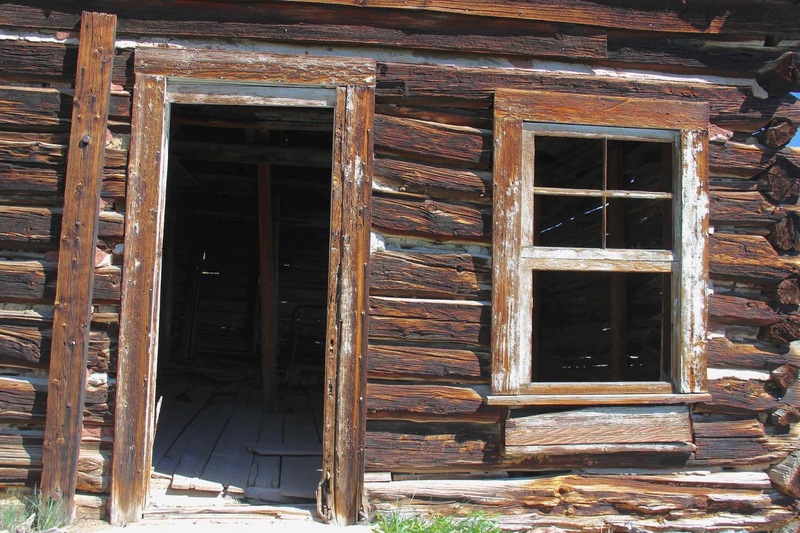 From its beginnings in the 1830s as a private fur-trading post, until the US military abandoned it in 1890, it was the most important outpost on the Northern Plains. 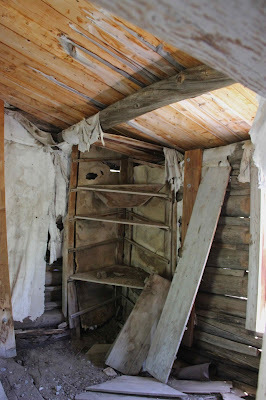 Trappers, traders, Indians, emigrants, gold miners, soldiers and settlers all came here—for commerce, supplies, advice, news, negotiations, peace-making and war. For many, it was their only connection to the civilized but hostile world back East. 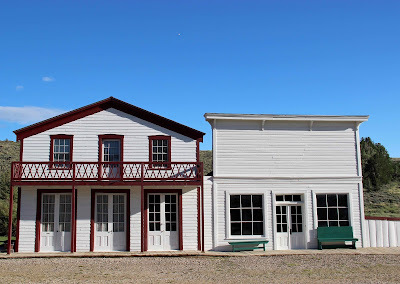 In 1849, the US Government bought the property from the American Fur Company to establish a US Army post, in part to make clear to Britain and Mexico that this was United States territory. The most important mission was protecting the tens of thousands of west-bound travelers who passed through each year on the Oregon/California Trail—probably the largest single land migration in history. Most emigrants had “jumped off” at the Missouri River, and had been on the trail for over a month when they reached Fort Laramie. 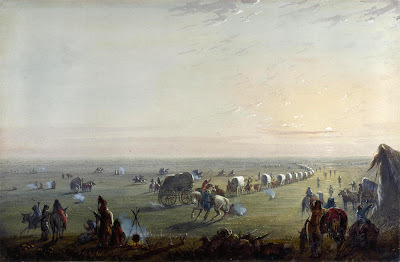 They averaged on the order of just 15 miles per day in the sweltering heat of the Great Plains, breathing dust churned up into great clouds by hooves, wagon wheels and human feet. The Fort was a welcome layover—a place to rest and fatten livestock, wash clothes, and repair wagons. It was one of the few places on the long journey to buy supplies. 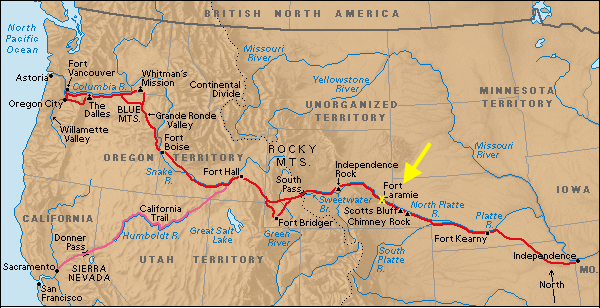 Fort Laramie was about a third of the way from the Missouri River to the coast (source). In the early 1850s, some 50,000 travelers were arriving at Fort Laramie each year! The total between 1841 and 1866 may have been 350,000, or as high as 500,000. These numbers speak to how difficult and dangerous life was for many people in the early days of our country. More than a few had lost everything to events beyond their control. What else could they do but leave, in hopes of something better? We were fortunate to have the huge sparsely-populated West and all it promised. Immigration—ever the hopeful path to a better life. Painting by Alfred Jacob Miller (wikimedia). My first visit to Fort Laramie was in July 1999, to prepare a vegetation map for the National Historic Site. It was hot! One afternoon while surveying open rolling country covered in sagebrush and grass, we came upon deep wagon ruts. 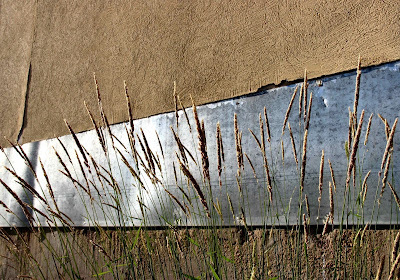 They were overgrown but still obvious—remains of the Oregon Trail. 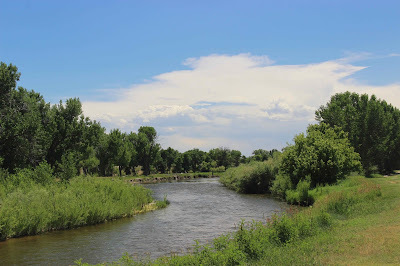 Standing in the broiling sun, I looked down on the Laramie River several miles away, and was struck by how blessed and inviting its lush green gallery forests must have appeared to early travelers. But I was wrong. 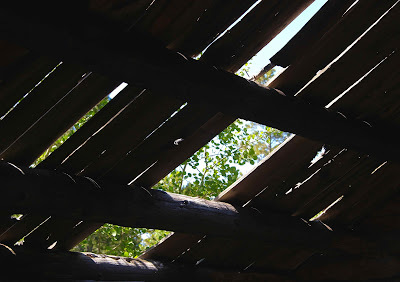 There were no trees along the river at Fort Laramie during the great migration, no shade to soothe weary souls. They had been cut down years earlier, for buildings and fuel. Crow delegation at the Fort Laramie council site in 1868 (from park interpretive sign). 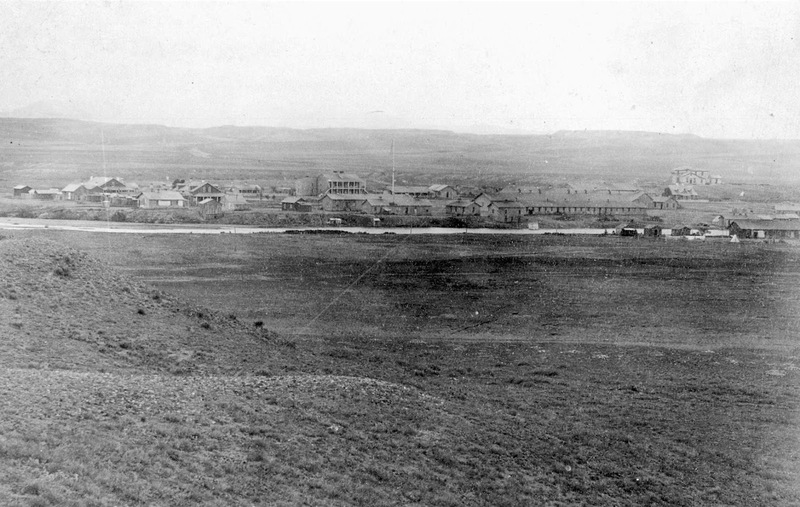 Fort Laramie was an important council site. 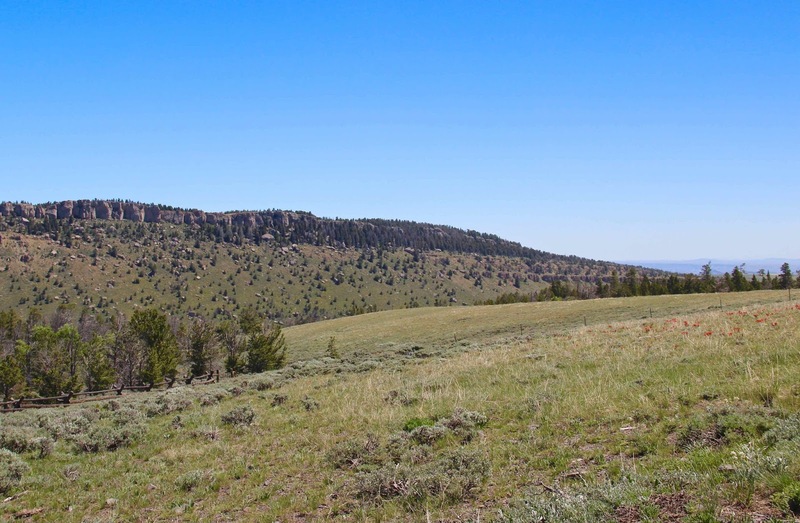 Indians set up camp on a large flat area east of the Laramie River, and prominent tribal leaders—Smoke, Red Cloud, Man Afraid of His Horses, Spotted Tail—met and negotiated with representatives of the US Government. 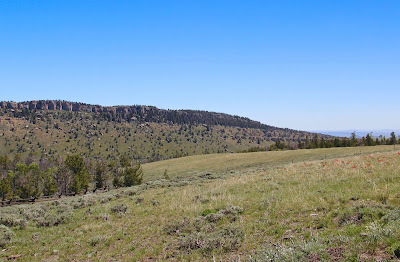 Today, an interpretive sign near the river explains: “The ridgeline in this image [above] can still be seen if one looks east across the Laramie River.” But one has to look carefully to spot any landmarks, as the council site is now largely hidden from view by trees. When the Army closed Fort Laramie in 1890, trees were returning to the river. A century later, with cottonwood groves well established, a debate arose: if there were no trees during the historical period of interest, do today’s interfere with re-creation of those times? 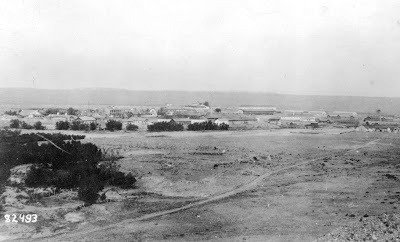 Fort Laramie in 1875, viewed from across the tree-less Laramie River (source). Fort Laramie in 1889, a year before it was abandoned. Trees line part of the river (source). 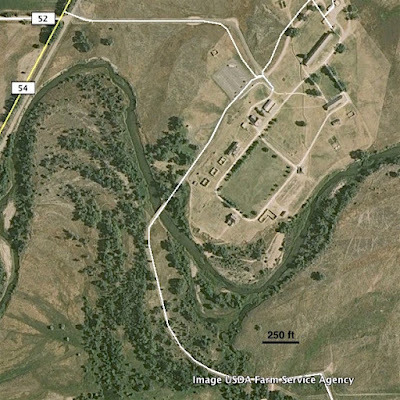 Fort Laramie in 2009, with cottonwoods, boxelders and willows along the river (Google Earth). “… need to have proper understanding and respect for the Fort's historic setting as well as its buildings. Over the decades the persistent efforts to plant parade ground trees which never existed during the "period of maximum importance," and to defend the post-1890 cottonwood grove along the river from any historical vista clearing … suggest that Park Service planners and managers have never been overly concerned with the sanctity of the historical setting.” (Mattes 1980; italics added). I have to admit, the "cottonwood grove along the river” definitely confused my interpretation of the historical setting! It was more harsh than I had imagined. Perhaps some trees could be cleared to restore the historical view of the council site, but I think it would be fine to leave the rest. Last week, with temperatures in the 90s, I happily took a break in the shade of cottonwood trees along the river. It didn’t diminish at all my appreciation for how tough those early travelers were! During our mapping project in 1999, we often took our lunch break in the saloon, cooled by an electric fan. “I’ll have a cold sas’sprilla” I’d say, pounding my fist on the bar in true Western style. Did soldiers and emigrants at Fort Laramie really have the option of an ice cold drink in the sweltering heat of midday? Most likely not, but I was sure glad we did! 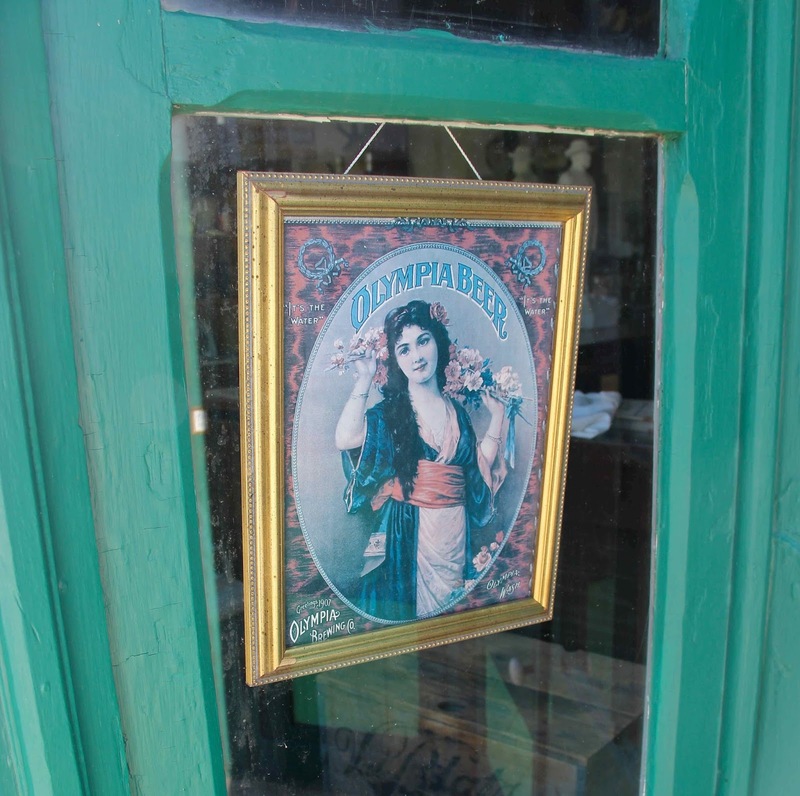 On my return visit last week, I again headed over to the saloon, pounded my fist on the bar, and said, “I’ll have a cold sas’sprilla.” The bartender obliged. It was just as refreshing as I remembered. 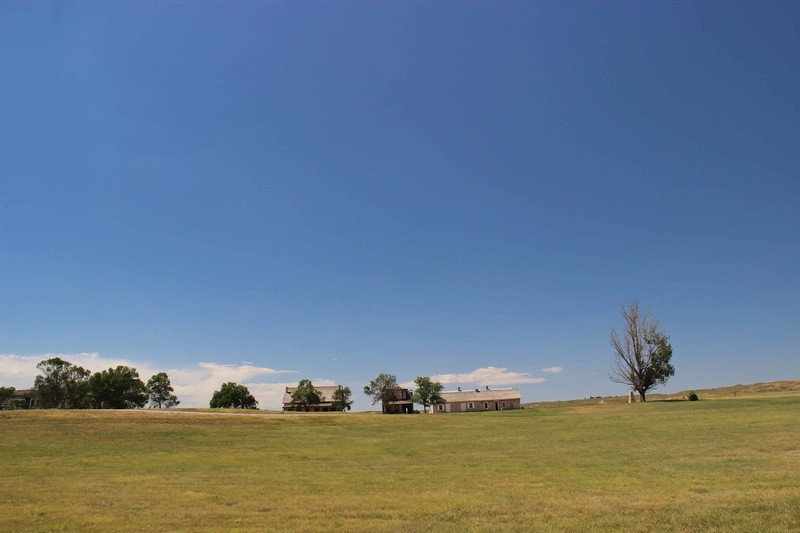 Fort Laramie National Historic Site is open year-round, no charge. Dogs are allowed on leash (outside). 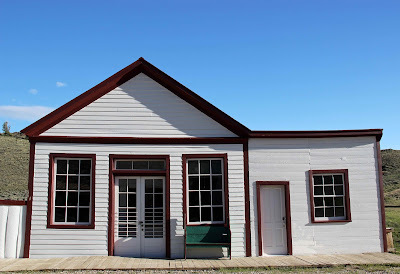 Summer days are hot, but maybe that’s the best time to visit if you want the real emigrant experience (peak visitation back then was late May to early July). 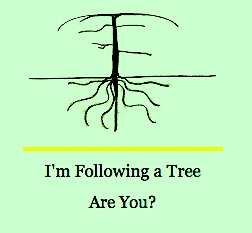 This is my contribution to the July gathering of tree-followers, kindly hosted by The Squirrelbasket. In lieu of following a specific tree (too much work and travel), I’m posting about trees, at least for a few more months. Buck, R. 2015. The Oregon Trail. Highly recommended (The New York Times agrees). Mattes, MJ. 1980. Fort Laramie park history 1834-1977. National Park Service. Last updated 2003; available here. National Park Service. 2014. Fort Laramie brochure. Available at the park. 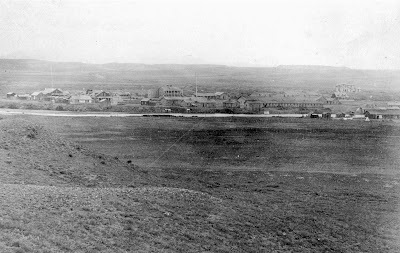 Old photos, drawings and other images of Fort Laramie are available here (no charge for non-commercial use). Unfortunately there’s little information about the scenes and sources.